I think autumnal color combinations are my favorites...I love the jewel tones. Fall is my favorite season and I don't even drink pumpkin spice lattes...though I do make lots and lots of pumpkin-y goodies in the fall. I'm having pumpkin baked oatmeal for breakfast this morning. But I digress! This color combination was another chance to play with Fresh Fig, so I did. We've got lots of birthdays coming up in the next couple of months (my brother, mother-in-law, sister-in-law, brother-in-law, and nephew, not to mention all my friends with fall birthdays and why am I friends with so many Libras?) so I thought a birthday sentiment would be a good idea for this one. Very simple for the leaves, I just stamped one in each of the challenge colors on Shimmery White cardstock and then cut them out with the matching Framelits. I spritzed the background with water and did a little Pear Pizzazz watercolor wash, dried it with my heat tool, and then stamped some flecks from Touches of Texture on it. The part that was difficult was deciding how to arrange the leaves on top. 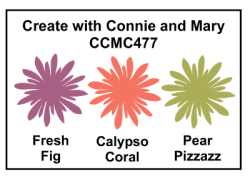 The Calypso Coral and Pear Pizzazz leaves are simply glued on, and the Fresh Fig leaf is popped up on Dimensionals. So anyway, y'all have a good weekend. Cheers! Very nice. I do like the background. Of course leaves are great and colorful. My favorite time of the year, too! I've just decorated my desk in Halloween. They were having their Halloween stuff at Michael's 50% off. I knew if I didn't grab what I'd had my eyes on, it would be gone in nothing flat. Now all I need to do is get Dad to put the inflatables up in the yard. I did mow yesterday, so the yard is ready for it! If you want to know more about me, you can visit my other blog, Snapdragon. If you want to see more of my stamping projects, see my Splitcoast gallery. Thanks for looking! Let's Hear It for the Boy(s)! On Stage and NEW STUFF!!! Don't Miss May's Paper Pumpkin!